BOSTON – The pre-Broadway engagement of “Moulin Rouge! The Musical” began Tuesday, July 10, 2018 at the Emerson Colonial Theatre. The production runs through Aug. 19. “Moulin Rouge! The Musical” stars Karen Olivo (Tony Award ® for “West Side Story,” “In the Heights”), Aaron Tveit (“Catch Me If You Can,” “Next to Normal)”, Danny Burstein (six-time Tony Award ® -nominee, “Fiddler On the Roof,” “Cabaret”), Sahr Ngaujah (Tony ® and Olivier award-nominee for “Fela”), Tam Mutu (“Doctor Zhivago,” Encores!’s “Hey, Look Me Over!” and “The New Yorkers”), Ricky Rojas (“Burn the Floor”) and Robyn Hurder (“Nice Work If You Can Get It”). 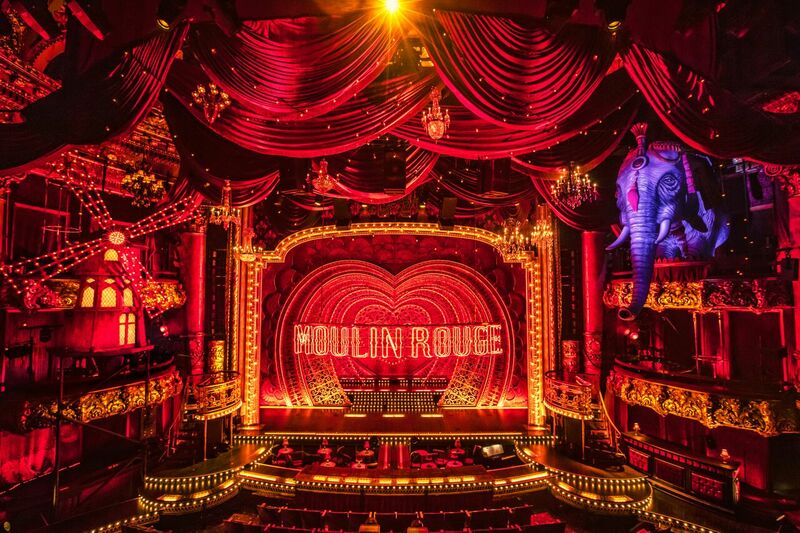 Set in the Montmartre Quarter of Paris, France at the turn of the century, a world of indulgent beauty and unparalleled extravagance, of bohemians and aristocrats, of boulevardiers and mademoiselles, “Moulin Rouge! The Musical” tells the fictional story of an ambitious, lovesick writer, Christian (Aaron Tveit), and a dazzling, entrancing chanteuse, Satine (Karen Olivo). Their lives collide at the Moulin Rouge with its many characters, including the host of the Moulin Rouge, Harold Zidler (Danny Burstein), the brilliant and starving artist Toulouse-Lautrec (Sahr Ngaujah), the greatest tango dancer — and gigolo– in all of Paris, Santiago (Ricky Rojas), the tempting Nini (Robyn Hurder), and The Duke of Monroth (Tam Mutu), the wealthy and entitled patron of the club who thinks he can buy anything he wants, including love. Directed by Alex Timbers (Tony Award ® -nominated for “Bloody Bloody Andrew Jackson” and “Peter and the Starcatcher”) with a book by John Logan (Tony Award ® for “Red”), choreography by Sonya Tayeh (Lucille Lortel Award and Obie Award for “Kung Fu,” and Emmy winner), and music supervision, orchestrations and arrangements by Justin Levine (“Bloody Bloody Andrew Jackson”) “Moulin Rouge! The Musical” will play this limited engagement at the newly refurbished venue (106 Boylston Street) prior to Broadway (New York City details to be announced). The design team for “Moulin Rouge! The Musical” includes Tony Award ® winner Derek McLane (sets), Tony Award ® winner Catherine Zuber (costumes), two-time Tony Award ® nominee Justin Townsend (lighting), Tony Award ® winner Peter Hylenski (sound) and Drama Desk Award winner David Brian Brown (wig and hair design). As in the film, “Moulin Rouge! The Musical” celebrates some of the greatest popular music of the last 50 years. The stage musical features many of the iconic songs from the movie and also includes recent hits released since the movie premiered 15 years ago. Released by 20 th Century Fox, “Baz Luhrmann’s Moulin Rouge!” premiered at the 2001 Cannes Film Festival. At the 74 th Academy Awards, the film was nominated for eight Oscars, including Best Picture, and won two. As previously announced, Ambassador Theatre Group (ATG) – Stephen Lewin, CEO, North America; Kristin Caskey, Executive Vice President of Content and Creative, North America – the world’s number one live-theatre company, has entered into a long- term lease agreement with Emerson College to operate the landmark venue. For more information: http://www.EmersonColonialTheatre.com; http://www.MoulinRougeMusical.com.